Wrightsville Beach, N.C. -- After its inaugural launch in 2011, the Carolina Cup quickly became one of the premiere stand up paddle board competitions in the world, drawing paddlers from as far away as California, Canada, Puerto Rico and Hawaii. Open to pros and amateurs, adults and children, the weekend-long event will begin on Friday, April 27 through Sunday, April 29. According to Co-Chair William Pope, registrations for 2012 far exceed 2011. Thus far, athletes from 3 nations, 18 states and the Commonwealth of Puerto Rico have signed up to participate in the Carolina Cup SUP races. As of today, approximately 70% of registrations are outside the state of North Carolina. Pope reminds local athletes not to rely on late registration, as each race is capped in 2012. Interest in The Carolina Cup has grown substantially and the Wrightsville Beach event is a qualifier for the World SUP Championships. Participating nations/commomwealth/states include: USA, Canada, Federated States of Micronesia, Puerto Rico, North Carolina, Florida, South Carolina, Virginia, Maryland, New Jersey, California, Massachusetts, New York, Pennsylvania, Connecticut, Georgia, Idaho, Texas, Illinois, Indiana, Oregon, Utah. The dynamic and strenuous paddling conditions of the Wrightsville Beach area will pose a significant challenge to competitors returning for another year as well as those testing the waters for the first time. The main attractions are the myriad conditions - from the flat waters of Banks and Motts channels to the wind-chopped surf of the Atlantic Ocean. There will be three different long distance courses, along with the Turtle Kids Race and the Sunday Sprint short distance race. The three different long distance courses are the 3.5-mile Harbor Island fun race, the 6.5-mile Money Island race and the grueling 12.5-mile Graveyard trifecta traversing inlets, ocean and channels. Only this race is open to elite division paddlers, all others are open to all levels of paddlers. There are different divisions for men and women, based on board length (14 feet, 12 feet 6 inches, 12 feet and under, Surfski and OC-1) and paddling position (prone or standup). Sunday's Carolina Cup Sprint Races will be open to men and women, exhibiting power and skill on the short course with one buoy turn on the water. Festivities for the weekend begin at noon on Friday, April 27 with standup paddleboard demos until 6 p.m., a clinic with SUP World Champion Candice Appleby and defending Carolina Cup Champion Anthony Vela from 2-4 p.m. Clinics will be followed by a race reception at the Blockade Runner Beach Resort from 5-8 p.m. The majority of the races will take place on Saturday, April 28 with an awards ceremony at 3:30 p.m. and an after party hosted by Surfers Healing at 7 p.m. The weekend will conclude on Sunday, April 29, with a racers' brunch, the Turtle Kids Race, the Carolina Cup Sprint Races, and more clinics from noon to 2 p.m. including one of the world's leading SUPers Danny Ching. Hosted by the Wrightsville Beach Paddle Club, the Carolina Cup is a qualifier for the World SUP Championships. Registration fees vary by race. Proceeds from this year's Carolina Cup will be donated to the Karen Beasley Sea Turtle Rescue and Rehabilitation Center on Topsail Island, Surfers Healing and Athletes for Cancer. 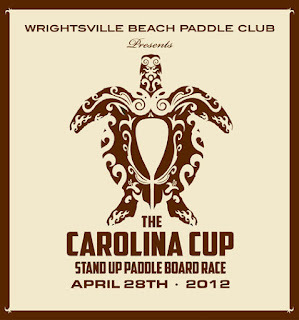 For more information and registration visit www.CarolinaCup-SUP.com.